This doesn't look like much but it proves that the whole current Red stack is working properly. Red compiler generates Red/System code in memory, that is then compiled to native code and linked in a 14KB executable file (contains the full Red runtime with currently 9 datatypes partially implemented). The baby needs a few more days in the nursery before I commit the new code to the v0.3.0 branch on Github. Once the existing datatypes will be more complete and once we choose how to deal internally with Unicode strings, we should be able to release the first Red alpha. 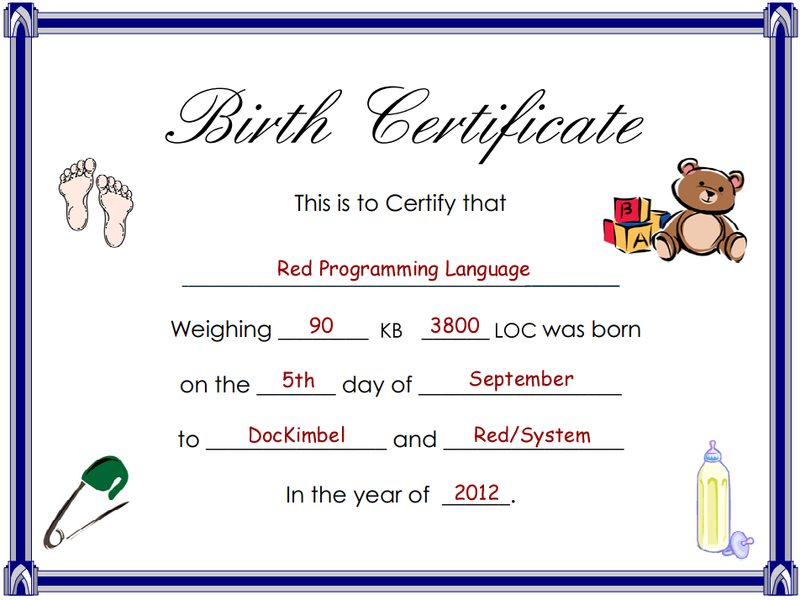 The current Red compiler is pretty simple and should remain light in the future. I have finally chosen an hybrid dynamic/static type system, to avoid diving into a complex type inference engine now, as I realized that once we get out of the bootstrap and have the final Red JIT-compiler, it will be much more easier to achieve. Also, I want to pass that bootstrap stage as soon as possible, because it is really limiting the full Red potential. Congratulation to the baby and his father. waiting for the baby saying "hello world !" Congratulations ! Nice to see this lightspeed progress! Thanks guys! For HelloWorld step, I would like first to figure out how to handle Unicode internally, which, for a cross-platform tool is really not trivial. Congrats Doc nice to see this! Bravo Nenad. J'espere que le bb va grandir vite! Excellent, on va suivre ça de prêt! Just read again this blog entry. It is near 7 years since its birth. Just look at how far things have gone.